When machining a part it is not necessary that your tools are always machining. When you start a machine in morning the tool turret will be in a safe collision free place, and when you press the cycle start button for the new workpiece the tool turret disk rotates for the proper tool and the tool comes to the workpiece with the full feed (rapidly). When that tool has finished its machining it again goes away from the workpiece with the same rapid feed for the next tool change, and the second tool comes with the same rapid feed. The above mentioned movements must be rapid to shorten the over all machining time for a workpiece. These rapid movement are in the hands of CNC Programmer. G00 is the G code for these rapid movements. 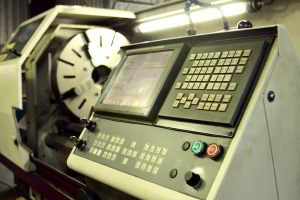 In CNC machining the CNC programmer has to decide which movement must be rapid so in CNC program he adds the G00 with coordinates to travel. The above line of CNC code is to travel the tool turret with rapid to the specified point which are 65 in x-axis and 10 in z-axis . The G00 or rapid traverse movement feed is set in the machine parameters. For normal CNC machines the rapid traverse movement feed is 10 m/min but for small CNC machines it can be 16 m/min.